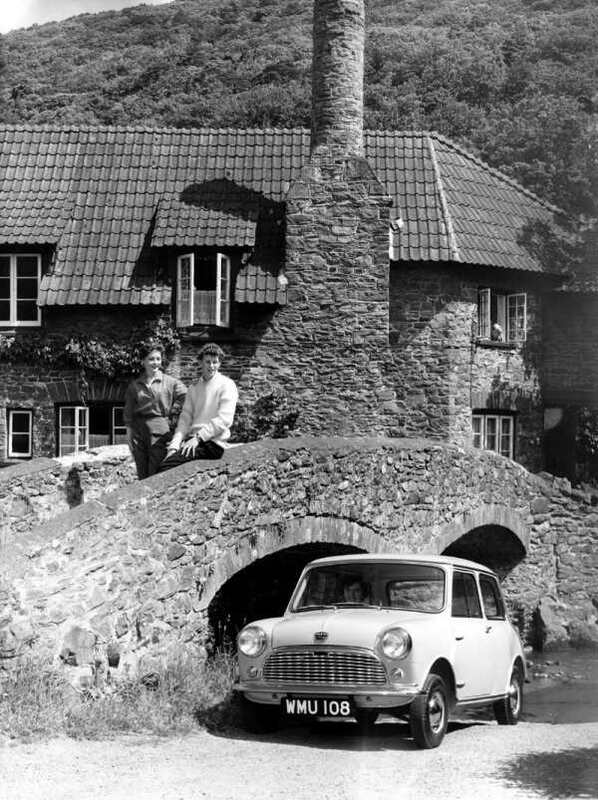 The B-Series engine started out as a humble 1.2-litre unit that powered the Austin A40 Devon. Over time, it was developed – and developed – and developed. After the end of World War II, Austin and Morris continued to rely on pre-war engines for their mid-range family cars. Out of the two companies, it was Austin that managed to introduce an entirely new engine for its A40 Devon model. This engine displaced 1.2-litres (65.5mm x 88.9mm bore/stroke), produced 39bhp at 4300rpm and was an overhead valve design. Morris, on the other hand, continued to rely on the side-valve solution for its engine, as used in the Issigonis designed Morris-Cowley. By the time of BMC’s formation in 1952, this was still very much the engine situation, and it meant that the company had a choice between the Austin A40 engine and the 1477cc Morris unit. Given the relative merits of the two engines, and the Austin-biased management in the new organisation, it comes as no surprise that the Austin unit was adopted as the new engine to power all of the company’s cars in the mid-range. Logically enough, it was subsequently dubbed the B-Series, and it proved to be significant in BMC’s history because its features defined the style for all of BMC’s later engines. Included in this list would be the location of its electrical equipment and the induction/exhaust complex on opposite sides of the engine block. Also, the pushrods passed through passages on the induction side of thecylinder head in order to avoid the use of pressed-in tubes passing across the plug cavity. The crankshaft had three main bearings and the connecting rods were split diagonally. In 1954, the first three-box BMC saloon was launched; the Austin Cambridge, which employed the B-Series engine in 1.2-litre guise, as well as a newly-enlarged 1489cc version. The uprated B was produced by a simple process of “boring-out” to 73mm. The power output of this version of the engine was 50bhp, which was produced at 4400rpm. This engine was also used in the Morris Oxford series II and the MG ZA Magnette, although the MG was treated to a twin-carburettor set-up, which boosted power to 60bhp at 4600rpm. It was with the engineers at MG that the B-Series went through further development in order to release more power – eventually resulting in the 68bhp version that powered the 1956 MGA. 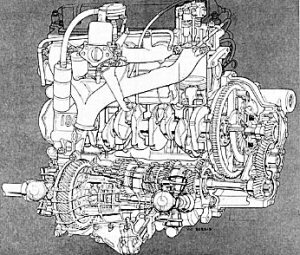 In 1961, the B-Series had been further evolved: the B’s engine block was redesigned in order to accomodate newly-siamesed bores, thus enabling the bore to be increased to 76.2mm. This increased the capacity to 1622cc and it was possible – with tuning – for it to produce 83bhp. This extra power was produced at 5600rpm, and these higher rev limits were possible thanks to the use of Vandervell VP3 in the main bearings. Among the other changes were improved valves, pistons and rings. It was not until the following year that a cooking version of the B found its way into the Farina saloons… they made do with a more realistic 61bhp at 4500rpm. Further development of the B-Series led to a 1798cc version of the engine, which – in three-bearing form – first saw the light of day in the MGB. 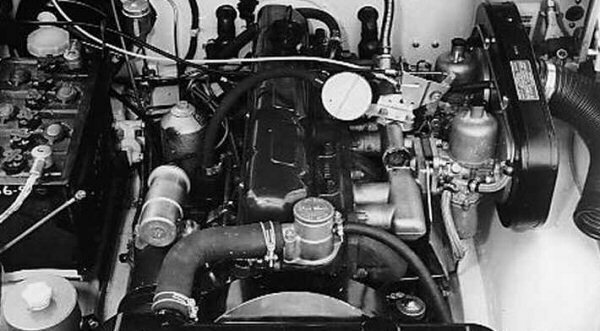 The bore centres remained the same as the original 1.2-litre A40 Devon engine, but the bore measurements grew out to 80.3mm. In time for the launch of the ADO17 in 1964, the three-bearing crankshaft was replaced by a five-bearing item in the interests of increased smoothness, and this new set-up resulted in a power output of 84bhp (gross) at 5300rpm. Development continued as far as the addition of twin-carburettors, a set-up developed with the help of Daniel Richmond, which was used in the Austin and Morris 1800S versions. By the early 1970s, it became clear that the B-Series needed to be replaced with a new unit that would be able to meet with upcoming US emissions regulations. The B-Series was by then, well established in 1800cc capacity alone, and was used in the front wheel drive 1800 models as well as the rear wheel drive Marina and MGB. Because a development programme to replace it never got far off the ground, the engineers at Abingdon worked hard on an OHC version of the engine, which would meet and exceed the forthcoming emissions regulations. This was the nearest thing to a replacement in the pipeline, and when it became clear that the ADO17’s replacement would need a de-smogged engine, the new car, which subsequently evolved into the Princess was designed to use the OHC version of the B-Series engine. Given that the two engines were initially going to be physically very similar, the development of the newer engine would not need to be accelerated to meet the new car. And that led to the MG engine being adopted as the corporate replacement for the B-Series, which resulted in further and wider ranging changes. The result was the O-Series; an engine that started out as being related to the B-Series, but became more of a case of the Irish hammer – two new handles, three new heads, but the same hammer! Beyond the C-Series derived 2.0(?) 4-cylinder prototype and a few other possible projects, does anyone know if Morris ever planned to develop a stillborn middle-market 4-cylinder equivalent to Austin’s B-Series unit? Apparently the B-Series was originally conceived as a 1.0-1.2 litre engine in the same way the later A-Series was conceived as a 0.8-1.0 litre unit. Nissan with the help of a retired engineer from Willys-Overlands called Donald Stone, would go on to develop the 988cc Nissan C Engine (also known as the Stone engine) out of the 1.5 B-Series. Speaking of which it would be interesting to explore Nissan’s usage of the A-Series and B-Series engines along with related replacements and parts interchangeability, it seems there is a lot of confusion out there. Seems some believe the Nissan D engine to be related to the A-Series despite featuring side-valves instead of OHV. The Nissan E (and later A) engine appears to be an all-new design inspired by Nissan’s improvements to the A-Series engine. Meanwhile Nissan’s usage of the B-Series beyond the 1-litre Stone engine and license built 1.2-1.5 B-Series along with related variants seem to appear under different names making it more difficult to decipher, though have some reason to suspect that Nissan basically developed their own distantly related equivalents of the 6-cylinder “Blue Streak” B-Series with the Nissan J and H engines. Does anyone known the story behind the Marcus V8, which was developed by one Tadek Marek from parts of the A40 engine while at Austin? And there you are with a bloody great picture of the B, showing intake and exhaust on the same side. Anyone with a pulse knows the B was never a crossflow engine. Really, for shame. But some dolt on MG Experience thinks it had a Heron head with Weslake combustion chambers. Wake that man up — A Heron head is flat and has no combustion chamber, it’s a cavity in the piston top. The remaining two pages of bloviation would do a PR consultant proud. Which nonsense is worse, I’m not sure. Having read MG experience for a few years i have come to the conclusion that MGB owners in the states tend to walk with there knuckles dragging on the ground. It is unfortunate there is no near-comprehensive B-Series equivalent of Graham Robson’s book on the A-Series engine, so as to explore experimental developments which like on the A-Series were either never incorporated into the B-Series or were eventually implemented on the later O/M/T-series engines, etc (plus Perkins/L/G-Series and Project Storm diesels). Known experimental B-Series developments so far seem to range from the 1-litre version (that reappeared at Nissan as the C / Stone engine), an A40-derived 6-cylinder (an ancestor to the Australian built Blue Streak engine) displacing around 2-litres that took the C-Series moniker (prior to the Morris-developed C-Series), a 1.7-litre version (possibly an earlier 3-bearing crankshaft unit), a 2-litre version in 106 hp OHV / 112-115 hp B-OHC forms and the Tadek Marek A40-derived V8. Given experimental versions of the A-Series featured 7/8-port heads, hemispherical heads / hemispherical combustion chambers, alloy heads, all-alloy and Cam-Belt / Belt Camshaft drives, etc. 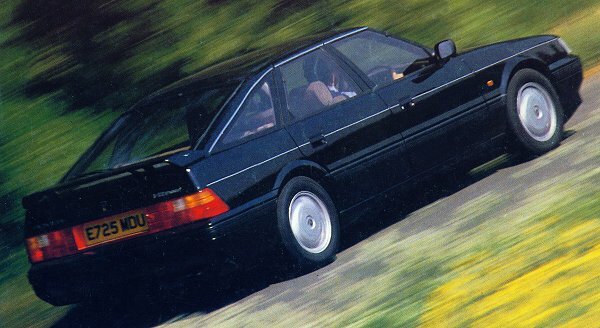 Surely Austin / BMC explored similar developments with the B-Series, even read in the O-Series Turbo – take one article of turbocharging being looked at for the B-Series to potentially use in the Sherpa.